What Specifically Makes The Meeting Place Church in Nanaimo Different? Anonymity - You can relax knowing that you will never be singled out, put on the spot, or embarrassed. Acceptance - At The Meeting Place it is ok to be a skeptic and have serious questions. We don't pretend that cliches and pat answers will work for you. Casual Atmosphere - No dressing to impress. Wear what's comfortable for you! Contemporary Music - No choir, no organ. Our top-line musicians play music that you've heard on the radio in order to introduce and illustrate the topic of the day. Multimedia - Creative and compelling media helps you focus on everyday solutions, and brings realism to your experience. Practical Messages - No spiritual jargon or ancient languages. The brief and powerful messages are engaging, entertaining, and strive to communicate powerful, life-changing content. No Financial Pressure - We are more interested in you and your spiritual journey than we are in your wallet. For real. Child Safe and Fun - We offer Nanaimo a Sunday morning where kids can experience a secure and seriously enjoyable environment with a purpose. The Meeting Place church in Nanaimo is designed for people just like you; people who have doubts and questions about God but come to the place in life where they desire to explore the answers and wisdom offered by Jesus Christ without anyone pressuring or judging them. 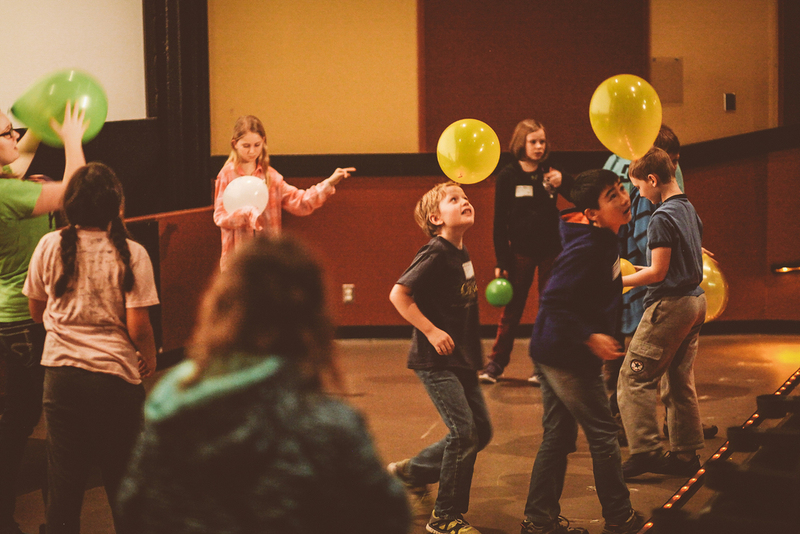 Our superfun, safe and edu-taining Tots Place and Kidz Place programs run during services, and are set up in various theatres and party rooms throughout the cinema complex. We've got multiple age-based programs designed for kids aged 0 to 10. From the moment you drop your child off using our secure sign-in system, to when you pick them up after the service, you can be sure your children are learning practical, values-based lessons in an atmosphere that's focused on treating others the way they want to be treated. We run Kidz Place for approximately one hour during our services at 9:00AM and 10:30AM. Children go to classrooms no earlier than 8:50 for drop off. * Once the check-in kiosk is closed, classes are closed and kids arriving are offered a kidzpack to take into the service. 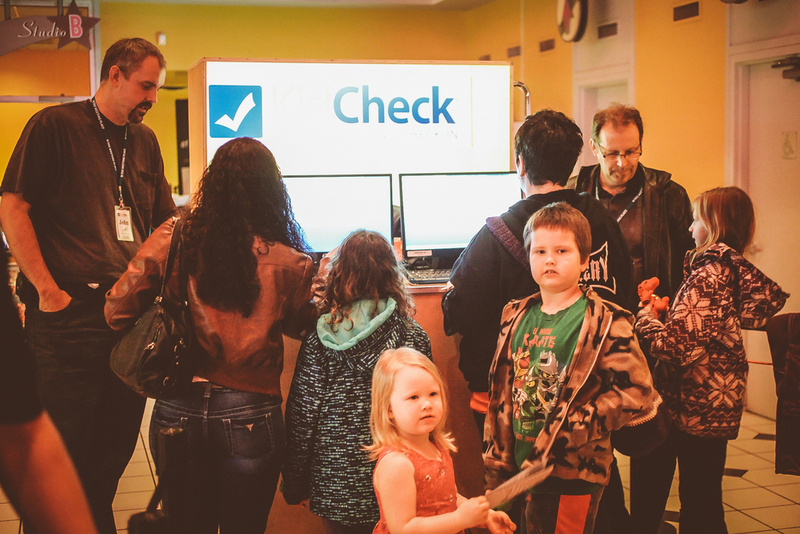 At Kidz Place we use the KidCheck sign in system for your children's safety and your peace of mind. Following your initial first-day registration in the lobby, check-in becomes a simple process you can do at home. Register now and when you arrive on Sunday morning you fill in your information that you signed up with, check in which which of your children will be in Kidz Place and you're good to go! Step 1: When you arrive for your first visit, you'll be helped through an easy check-in process. Step 2: Just fill in your information, scan your provided bar code and you're set! It's as easy as that. Step 3: Your children will be safely monitored by dedicated volunteers in their clearly labeled respective theatres and you'll receive an instant text message should any need arise. We take your children's safety seriously. We have emergency procedures in place in case we have a fire alarm or other events during any time your children are attending Kidz Place. Feel free to get in touch with our Kidz Place leaders. They will get back to you as soon as possible. It all begins with our weekend services: Great music and interactive media … friendly people in the lobby following the service, talking, laughing … your kids being welcomed by caring leaders in Kidz Place … not having to worry about being singled out as a visitor or being pressured to give money … wearing clothes you’d wear to a friend’s house … messages that are tied into everyday life … a place where you'll be encouraged and equipped to become your future best! Our website is designed with this goal in mind: To help you explore what this church in Nanaimo is all about… no matter from where you are starting or to where you are heading. Everyone has a purpose and a role to play in life, and at The Meeting Place we believe that you have been created to play a positive and life-changing role in our community, our city, and our world. No matter where you've been, what you've done, or what's been done to you, whether you believe in God or not, God believes in you! At The Meeting Place church in Nanaimo you can belong without having to believe. There is always a place for you, no matter where you are in your spiritual journey. Where do I start to get connected? Your unique personality and gifting is part of this work of art that we call The Meeting Place. Your heart, your passion, your willingness to serve others, and allow others to serve you, regardless of where you are in your spiritual journey, is welcomed. There is a place for you at The Meeting Place! Would I really make a difference? The 'The Meeting Place' comes from the Coast Salish First Nations People who originally named this part of Vancouver Island "snew-nay-mow" (Snuneymuxw) which means "the meeting place" or "a big, strong tribe". Our church community has arisen from the diversity of the people in our community and from the belief that when we all come together under the common purpose of living out the love of Jesus Christ, we can change the world for the better. And yes, that includes you! I’m ready! Who can I talk to? One of the best ways to explore how you can get connected is by attending a TMP 101 course. Or, just email us at connect@themeetingplace.org and fire away with any questions you have! Or, drop by the Info Table in the lobby on Sunday morning.